The St. Louis chapter of the American Orff-Schulwerk Association is a vibrant, exciting organization dedicated to providing professional development opportunities of the highest caliber to our members and the music education community of the St. Louis area, eastern Missouri and western Illinois. We have members from Hannibal in northern Missouri, to the Missouri boot heel in southern Missouri, to the suburbs east of St. Louis in Illinois and beyond. Our membership every year is around 100 members. 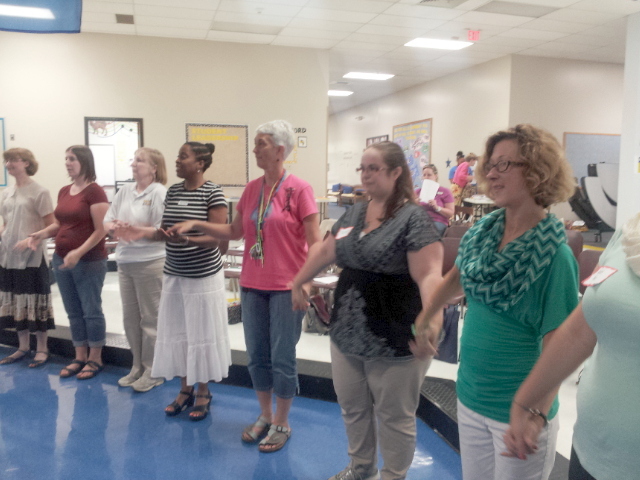 Our chapter presents five workshops every school year, with four of the workshops featuring outstanding teachers in the Orff-Schulwerk approach who are known nationally and internationally. A short list of our outstanding presenters from the past few years include Angela Broeker, David Frego, JoElla Hug, Shirley McRae, Artie Almeida, and Roger Sams. Two of our workshops each year feature St. Louis chapter members as presenters. Our chapter is full of talented teachers and musicians. Several of our chapter members have published works, have taught Orff Levels courses, and have presented at local and national workshops, including the National AOSA Conference. As we say, the best music teachers in St. Louis come from St. Louis Orff! But – before we sound too proud, you should also know that our chapter is a group of warm, caring, creative, open-minded people who are always ready to learn more about the greatest job in the world – teaching! We are dedicated to the idea of continually learning from each other. At a St. Louis chapter workshop there’s a spirit of adventure, fun, and acceptance of everyone’s ideas, no matter if you’ve been teaching for 30 years or if you’re still in college. If you come to one of our workshops, be prepared to get up and participate, sing, dance, play instruments, learn, and make fast friends. We welcome you anytime! To be added to the St. Louis Orff e-mail group, and get important information about our chapter, send an e-mail to stlaosa@gmail.com.